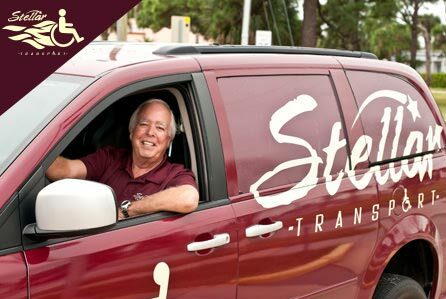 At Stellar Transport we offer 2 main categories of transportation services, local and long distance. Long Distance Transportation is for rides that will be a MINIMUM of 150 miles. We will come pick you up anywhere in the state of Florida and drive you wherever you need to be, even if it is out of state! If you are looking to book a local medical transportation trip CLICK HERE to see our local service page. We will select the right vehicle from our fleet to make sure your ride is comfortable and enjoyable. If you need to go to Jacksonville or Miami, we have the right ride for your trip. Depending on your situation, needs and preferences, your transport team will consist of up to five attendants. All of our team members are HIPAA certified, trained in patient and elder sensitivity, defensive driving, and taken a full-day situations and response class. All of our transporters are drug, alcohol and smoke-free, and we have an incentive system with contests and prizes, which promotes and rewards excellence. We are focused on your safety, and comfort, and making sure our passengers have a pleasant experience. We even have a broad music selection in the vehicles for your enjoyment. Experience the difference Stellar Transport offers.